Frampton's Pill of Health for bilious and liver complaints and indigestion. A magazine advert published in 1860. A magazine advert published in 1863. 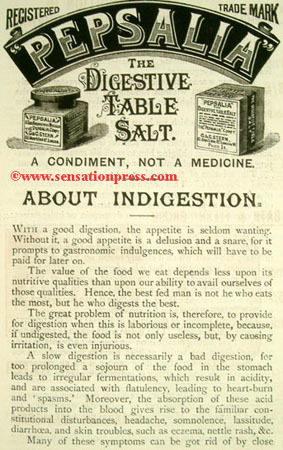 'an effective cure of Indigestion, all Stomach Complaints and Liver Affections. Page Woodcock's Wind Pills, manufactured by Page D. Woodcock. A magazine advert from 1876. Morson's Preparations of Pepsine, made by Morson and Son. Kinmond's Double Strength Fluid Magnesia. Pepsalia, The Digestive Table Salt. A magazine advert published in 1891. 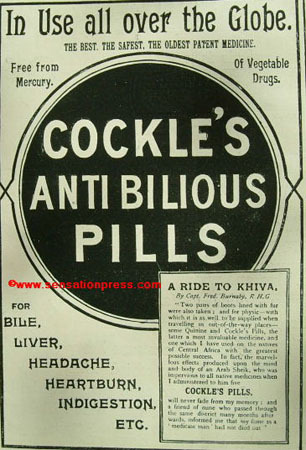 Cockle's Anti-bilious Pills, with a celebrity endorsement by Captain Frederick Burnaby. An advert published in a magazine in 1894. The Charles A. Vogeler Company. A magazine advert published in 1894. W. Marshall & Sons, Victoria Cytos Mills. An advert published in a magazine in 1896.